Granite countertops have become the standard for newly remodeled kitchens, and they’re an upgrade real estate ads often mention in their list of home features. No longer is this gorgeous, strong material reserved just for luxury homes, as customers are realizing that installing granite countertops doesn’t have to break the bank. Granite is formed by extreme heat and pressure underneath the earth’s crust and can be mined in many different countries, including Italy, Brazil, India, Canada and the United States. If you select granite mined closer to home, it will often cost less. The price of your granite countertop will vary depending on how much of that particular stone is available. If there is an abundance of the stone, it is likely to be less expensive. The harder to find, the more likely it is to cost you more. As with color, the intricacy of the countertop edges profile greatly affects the price. 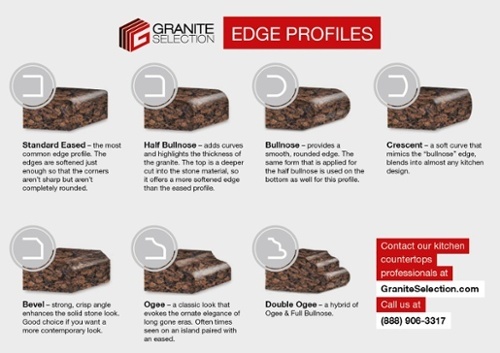 Edges can be formed in Eased, round, bevel, bullnose. The more complex the edge, such as a waterfall or an ogee edge, the more the cost will increase in fabrication than a round or eased edge. here are also additional costs that may be added on at the end, such as certain sealers that only need to be resealed after several years. These sealers and finishes are all up to the discretion of the client, of course. Whatever budget you’re working with, there is a style of granite and package to meet your needs. 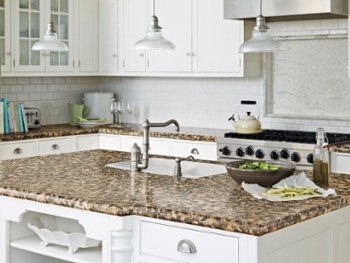 Granite Selection is available to help with any of your remodeling needs. Visit our website to browse our wide selection of stones or call (888) 906-3317 to schedule our free in-home measurement service.